CarGurus has 8,662 nationwide CTS listings starting at $2,288. To exercise a Cadillac CTS Vsport to its maximum potential, you really need a racetrack to find its limits, which is the sign of an outstanding sport sedan. Look no further than the 2015 CTS for evidence of Cadillac’s ongoing transformation. This midsize luxury sport sedan requires greater attention to the details, but gets the fundamentals exactly right. Now all Cadillac needs to do is convince consumers to consider one in the first place and give them great reasons to buy a CTS. Born and raised in the Detroit area, I’m no stranger to Cadillacs. My grandfather owned several Coupe de Villes of late 1960s and early 1970s vintage, and my father owned a beautiful ’78 Seville. Even Dad’s blacked-out ’83 Eldorado Touring Coupe was cool. Kind of. And to this day, I vividly recall a childhood visit to Cadillac’s Clark Street assembly plant, watching intently as workers married bodies to frames. Three decades on, having endured a torturous extrication from its reliance upon members of the Greatest Generation to drive sales, Cadillac is slowly and painstakingly rebuilding itself, in pursuit of its former stature as a standard of the world. More than a decade of bespoke engineering has put Cadillac on a clear path to redemption, but the brand’s image remains a problem. And that leads to other problems. Later this year, Cadillac will launch a pivotal new model called the CT6. A showcase of what Cadillac can do in order to appeal to a global audience, the 2016 CT6 will become the new flagship of the brand. In the meantime, you have the 2015 CTS to consider, a midsize luxury sport sedan that will continue in production once the CT6 arrives. Almost desperately, I want to advocate for this car. Maybe it’s the Detroit boy in me rooting for the home team, or maybe it’s because the CTS is different from what everyone else drives in L.A., or maybe it’s because this is one of the first Cadillacs that truly demonstrates, in part, why the brand deserves a return to A-list status. One of the problems with the CTS, though, is its price. Just because this car provides competitive size, features, technology, and driving dynamics does not mean that Cadillac can charge the same amount of money for it. Cadillac must earn that right. Furthermore, the base price of $46,340 almost represents a bait-and-switch approach. That figure does not supply leather upholstery or a split-folding rear seat or a reversing camera or a decent set of wheels. Yes, I know that this is also true over at the BMW and Mercedes-Benz dealerships. But take a look at how Audi and Infiniti price and equip the A6 and Q70. Both of these automakers appear to understand that in order to overcome the allure of established, respected, and aspirational competitive brands, they must provide a perceptible benefit in terms of value. Maybe this is why Johan de Nysschen, former boss of both Audi and Infiniti, now helms Cadillac. Personally, I’d rather own and drive something different, something I’m not going to see every single day, let alone every single commute. The Cadillac CTS is mighty appealing from this perspective, especially in Los Angeles, where my CTS Vsport test car was a 4-wheeled unicorn. Californians take note of the CTS Vsport, and for good reason. In a region where you can’t drive more than a mile or two without seeing a leased Mercedes-Benz E350 sedan in some shade of black, white, or gray, the distinctive CTS Vsport, with its cool vertical LED running lights, bold grille, creased styling, and attractive Midnight Silver wheels, stands out from the pack. 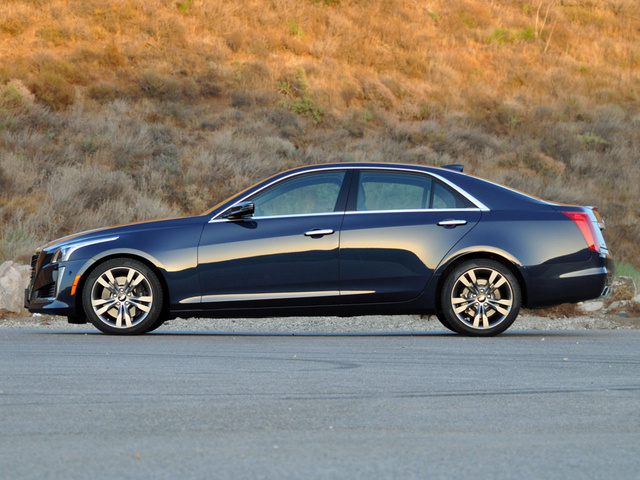 Better yet, it is easy to tell at a glance that this is the CTS, and not the smaller and less expensive ATS. Especially now that a redesigned 7 Series is about to go on sale, it’s sometimes tough to tell what flavor of BMW you’re looking at, because they all look the same. Cadillac styles the CTS to its Art & Science design idioms, but at the same time gives it a clear identity. This is not the case when it comes to the interior, which is basically a larger and more comfortable version of what you get in the ATS, except for a motorized cupholder cover that is likely to eventually break and irritate the CTS’s owner. Unfortunately, this approach also means that like other Cadillac models, the CTS is loaded with black plastic trim that rapidly gathers dust and fingerprints. While a base version of the CTS struggles to deliver value, the racy Vsport model does not. Priced from just over $60,000, nothing else in this car’s class can touch the CTS Vsport’s ability to produce motive force, though Infiniti comes close with the Q70 5.6, and Hyundai isn’t far off with the more affordable Genesis 5.0. 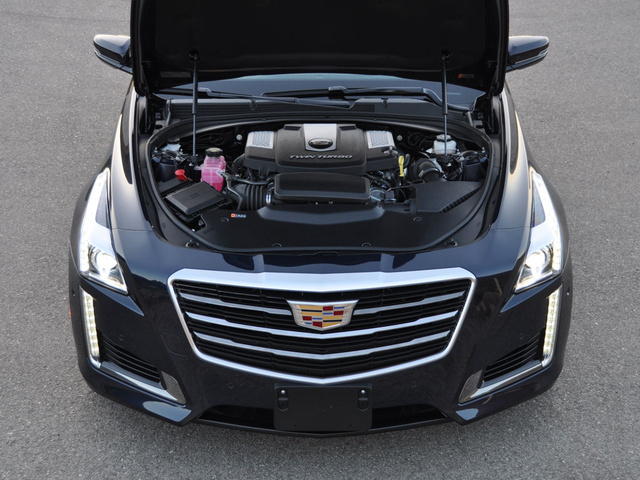 In the CTS Vsport, a twin-turbocharged 3.6-liter V6 engine whips up 420 horsepower at 5,750 rpm and 430 lb-ft of torque between 3,500 rpm and 4,500 rpm. Acceleration to 60 mph takes 4.4 seconds, according to Cadillac, and it sure feels like that’s true from the driver’s seat. As important as these numbers are, it is also critical to remember that a CTS Vsport weighs less than two tons, at 3,984 pounds. That’s 55 pounds less than the nearly as powerful Q70 5.6, 128 pounds less than the weaker Mercedes-Benz E400, 293 pounds more svelte than the pricier BMW 550i, and a whopping 498 pounds trimmer than the spendy Audi S6. The Genesis 5.0 is the heavyweight of the group, though, tipping the scales at 557 pounds more than the Caddy. Cadillac’s twin-turbocharged V6 engine revs willingly, and the exhaust note sounds aggressive, in an appropriately understated manner. Despite regular use of the powertrain’s talents, I averaged 17.8 mpg, nearly matching the CTS Vsport’s official EPA fuel economy rating of 18 mpg in combined driving. An 8-speed automatic transmission delivers power to the car’s rear wheels and includes a manual shift mode and paddle shifters. An electronic locking rear differential is also standard for the CTS Vsport, helping this sport sedan rocket out of tighter corners. Driver-selected Tour, Sport, Track, and Snow/Ice modes help tailor the car’s behavior to specific types of driving. The majority of the time, I preferred to keep the Vsport in Tour mode, reserving Sport mode for workouts in the local mountains. In Sport mode, the transmission stands at attention, ready to respond with healthy helpings of horsepower and torque at a moment’s notice. Manual shifting proved less satisfying than letting the transmission’s software algorithms sort everything out, and I found that I could cover ground at a quicker pace when I didn’t need to worry about flapping the paddle shifters. As proof that Cadillac takes stopping as seriously as it does acceleration, performance brakes with 4-piston front calipers are standard equipment for the CTS Vsport. My test car also had the optional performance brake linings, well worth the extra $100 but at the same time begging the question, “Why aren’t these standard?” Whatever the case, know that on a hot testing day with temperatures in the 90s, my CTS Vsport’s brakes performed flawlessly, suffering zero fade despite a hard run across the Santa Monica Mountains. Equipped with an enhanced steering system unavailable to other CTS models, the Vsport eagerly rips down a road, always ready to dive hard into a corner. In fact, to exercise this car to its maximum potential, you really need a racetrack to find its limits, which is the sign of an outstanding sport sedan. Cadillac also installs a performance-tuned version of its Magnetic Ride Control suspension in the CTS Vsport, a real-time damping setup that the company says can read the road surface 1,000 times per second. In the Tour driving mode, the car feels a little softer and more compliant, but not at all disconnected from the surface. In Sport mode, the suspension delivers an undeniably firm, frequently choppy, ride quality. Does this Caddy ever float or wallow? Never. As thrilling to drive as a similarly priced Audi or BMW, the CTS Vsport exhibits an old-school authenticity frequently lacking in modern sport sedans, a rough-hewn character unmasked by technology. Imagine the CTS Vsport as a bloodied and mumbling Rocky Balboa going into the 15th round with a cocky Apollo Creed, and you’ll get a sense of what I’m trying to illustrate as Cadillac fights to regain its street credibility. Go for it, Caddy. I’ve got your back. Mostly. Where Cadillac needs to improve the CTS is with regard to perceptions of quality. Don’t get me wrong; my CTS Vsport was loaded with soft and smooth leather, fabric-wrapped roof pillars, plush carpeting, and more. However, greater attention to the details is clearly warranted. For example, my test car had fewer than 4,000 miles on it, yet the cabin emitted a symphony of vibrations, buzzes, and creaks. The plastic covering the car’s B-pillars and doorsills looked and felt more appropriate for a Chevrolet than a Cadillac, and some of the car’s switchgear definitely looked and felt a class below in relationship to the CTS’s price. (That’s right, “M” button located atop the shift knob, I’m talking about you.) Don’t even get me started on how my test car’s trunk was trimmed. How Cadillac could design something as appealing as the CTS, and then engineer something as brilliant to drive as the CTS, and then fumble at the 5-yard line by trimming pennies here and there, thinking buyers wouldn’t notice, is unconscionable. Using the CTS is sometimes a challenge, too. For example, fast-flowing traffic was coming to a rapid halt ahead, so I glanced at the dashboard to find the hazard flashers and activate them. They were not positioned in the usual locations. As it turns out, they’re to the left of the center touchscreen display, and sun glare had obscured them from view, the touch-sensing activator a part of the sea of black plastic that is the Cadillac User Experience (CUE). As another example, my Vsport test car included heated and ventilated front seats. On one hot day, I activated the driver’s seat ventilator, touching the part of CUE that turns it on. Unfortunately, my sweaty backside couldn’t feel much in the way of cooling, and because three orange lights had illuminated next to the seat heater icon, I thought I had mistakenly turned on the heaters. 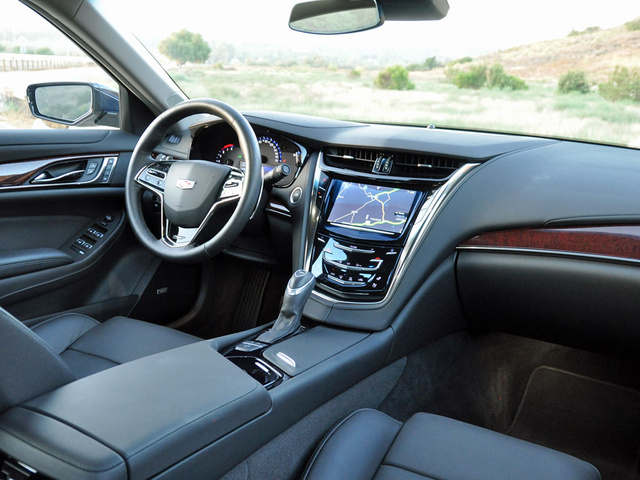 Cadillac, please improve the ventilated seats so that occupants can feel them working. Also, use three blue lights next to the seat fan icon to indicate that they are, in fact, active. Speaking of the seats, the CTS Vsport handles curves better than its standard seats can hold a body in place. You can upgrade to Vsport Premium trim to get 20-way power adjustable front seats that likely perform far better in this regard, so if you’re planning to take corners with gusto, I recommend spending the extra cash. 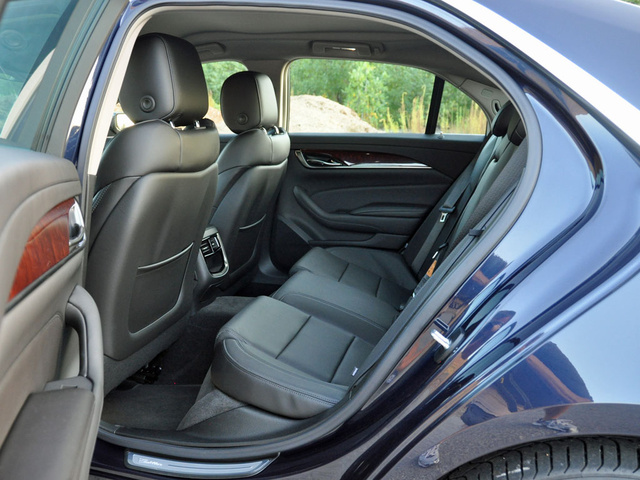 Otherwise, rest assured that you’ll find the CTS comfortable, even if you’re riding in the back seat. 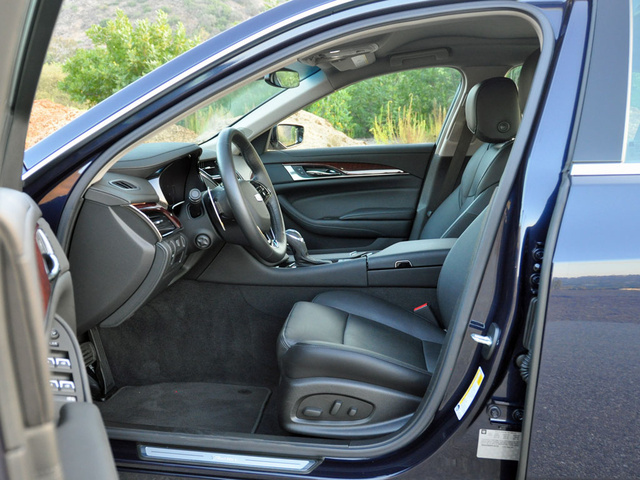 While the previous version of the CTS had a tiny rear seat that was genuinely difficult to crawl into and out of, the latest iteration of the car resolves that problem. You’re not going to be stretching out like you might in a Cadillac XTS, but from seat cushion height and thigh support levels to legroom and foot space, the 2015 CTS is competitive in its segment. The trunk does remain small, however, measuring just 13.7 cubic feet. Cadillac configures the space in a useful manner, though, and it is possible to stack a full-size suitcase on its side and to place a compact folding stroller into the trunk wheels-first in order to maximize utility. Like any new technology, Cadillac’s CUE infotainment system is getting better. Honestly, I have no idea if this is because the company is regularly improving it, or if this is because I’m getting more accustomed to CUE and similar types of systems in other vehicles. With that said, I still think using knobs and buttons for the most frequently used functions are better than proximity-sensing this and haptic-feedback that. Knobs and buttons can be found and operated without looking away from the road. Cadillac’s CUE cannot. The result is distraction. Good thing, then, that the CTS’s forward-collision warning system stands at the ready to scare the living you-know-what out of you with bright red flashing lights and a shrill alarm. Nevertheless, I’ve made my peace with CUE. In fact, my biggest gripe with the system now is related to the number of fingerprints that the black plastic touch panel and the display screen accumulate. During my week with the CTS, I kept my test car’s dashboard from looking like the register at a greasy spoon diner by regularly using one of those little microfiber cloths used for cleaning sunglasses. Cadillac divides its roster of CTS safety features into a Driver Awareness Package, which is standard for all models except the base version of the car, and a Driver Assist Package, which requires Premium trim. My Vsport test car had the Driver Awareness Package, which contains a reversing camera, rain-sensing wipers, automatic high-beam headlights, a blind-spot monitoring system with lane-change alert and rear cross-traffic alert, a lane-departure warning system with lane-keeping assist, and a forward-collision warning system. Each of these features is a blessing rather than a curse, though the forward collision warning system occasionally issues false alarms. Furthermore, it blares its warnings, making it utterly impossible to ignore. The Driver Assist Package takes safety technology to the next level, installing an adaptive cruise control system, automatic front and rear braking systems, and automatic collision-preparation technology including automatic seatbelt tightening. While these features do come standard for the Premium trim level models, Cadillac could probably make them optional in order to ratchet down the car’s price even more. Except for the fact that the CTS has not been subjected to the small overlap frontal-impact crash test performed by the Insurance Institute for Highway Safety (IIHS), this Cadillac gets high marks for collision protection. The federal government assigns the car a 5-star overall rating, while the IIHS gives the CTS a Good rating for tests against which the car has been assessed. Although the current CTS is the best one ever, sales have dropped significantly since the car was redesigned for the 2014 model year. At that time, the CTS became a full-fledged mid-luxury sedan, in terms of both size and price. Unfortunately, this maturation of the model is lost on Cadillac buyers. Higher prices, especially for models equipped the way most people want one, are just one part of the problem. At the same time, ALG says that the Cadillac CTS enjoys a depreciation rating of just two stars, and along with the car’s inability to hold its value, cost of ownership ratings have also tanked. Plus, the CUE technology appears to be taking its toll on how owners rate the latest CTS in terms of quality and reliability. Cadillac didn’t want to find itself in this position. The idea was to make the CTS great and charge for that greatness without resorting to a deal-of-the-week approach to moving the car out of showrooms. Nevertheless, that appears to be exactly what is happening. As this review is written, Cadillac is offering every customer a cash rebate, and if you already own or lease a Cadillac, the company is nearly doubling the discount. You can finance a Cadillac for 60 months without paying any interest, an appealing option for buyers with money to invest elsewhere. Leasing is also an option, though at nearly $500 per month with nothing down for a base model, and with just 10,000 miles allowed per year, this deal is not necessarily appealing. I want, badly, to be a staunch advocate for this car. 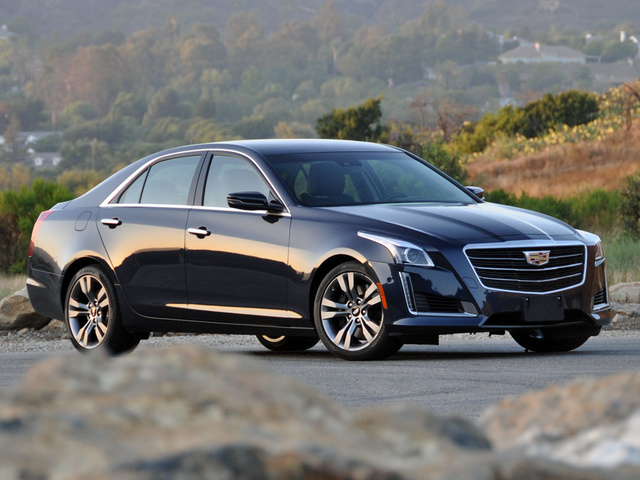 I want to tell you to buy the CTS over its competitors, because I certainly would be tempted. But unless you are a driving enthusiast seeking a thrill ride in the Vsport model, which is a genuine performance value, I cannot in good conscience do so. In order for Cadillac to restore true luster to its new crest emblem, the company’s products need to be about more than design, driving dynamics, and technology. Cadillacs must also exude quality, prove faultlessly dependable, and represent a smart value. 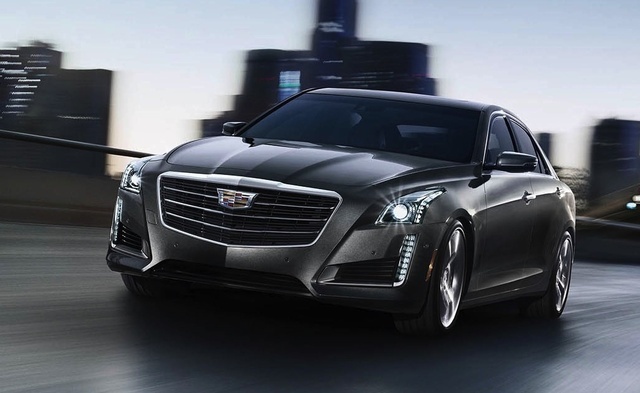 What's your take on the 2015 Cadillac CTS? migration_CguckGap I think all the Cadillac models are overpriced. As GMs flagship model I would expect LED headlights to be standard and not require one of the higher trim levels to obtain. I do think the high depreciation is a plus for the consumer. Not that I am comparing the Mazda 6 to an ATS but a fully decked out Grand Touring with every bell and whistle is about $32,000 compared to over $45,000 for the ATS. I wonder four years from now what the resale value of each of these will be? 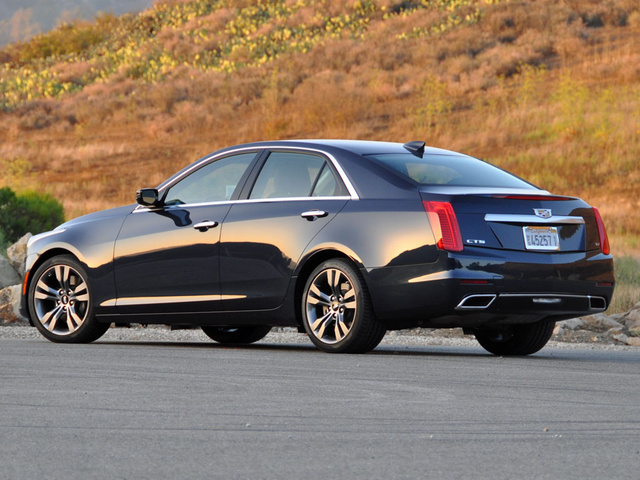 Users ranked 2015 Cadillac CTS against other cars which they drove/owned. Each ranking was based on 9 categories. Here is the summary of top rankings. Have you driven a 2015 Cadillac CTS?